England are bidding, in five ODIs this month, to follow up a 3-0 home win over the world champions who will be without the mighty collective talents of Sachin Tendulkar, Virender Sehwag and Zaheer Khan through injury. Despite India’s injury problems, England still cannot fail to be mindful of well-documented difficulties on previous limited-overs trips to this country – in which the overall scoreline from the last two tours stands at 10-1 in the hosts’ favour. Cook, a winning captain in both his attempts so far since taking over permanently from Andrew Strauss, will dwell on neither past success nor failure as an accurate barometer of England’s chances. What he is sure of, though, is that the players at his disposal – even in the absence of the rested James Anderson and the injured Stuart Broad and Eoin Morgan – are up to the challenge. “It’s great to see the enthusiasm the youngsters bring,” he said after their first training session of a four-week trip which will be a step into the unknown for several emerging cricketers. Of those with slightly more experience, the need to deputise effectively for pace bowlers Anderson and Broad in particular is obvious. Cook rules out the relevance of England’s evident superiority over India in the summer – preferring to concentrate on the here, the now and the imminent future. “I don’t see any relation between what happened in England and what’s going to happen out here. 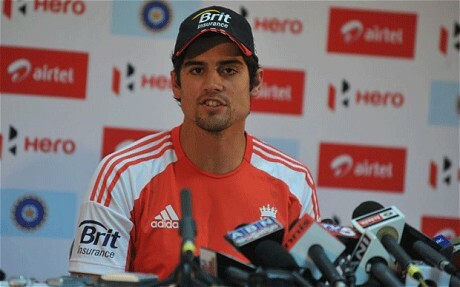 “We are expecting a battle, predominantly on slow wickets. India are historically very strong at home, and we have an extremely tough challenge on our hands – but one I think we can cope with. England are a little wiser, as of this morning, about what lies immediately ahead – after the uncertainty about their two warm-up matches in Hyderabad was belatedly cleared up. On Saturday, and next Tuesday, England will play a Hyderabad Cricket Association XI at the Rajiv Gandhi Stadium in day-night fixtures – under the latest International Cricket Council ODI rules. That means two new balls, one at each end, and both batting and bowling ‘powerplays’ to be taken in the middle 20 overs of the innings. Cook acknowledges the need to come to terms quickly with the innovations. “It is learn-as-we-go, how the new rules affect things – with two new balls and the powerplay changes,” he said. “That’s why these two warm-up games will be so good for us. Cook made many eat their words last summer, after they had expressed doubts about his suitability to open for England in the 50-over format. Both his average, and crucially his strike rate, were impressive in series victories over Sri Lanka and then India. But he faces another acid test, to demonstrate he can score as quickly and consistently on Indian pitches. “I haven’t played a huge amount of one-day cricket on the sub-continent; I’ve played in Sri Lanka and Bangladesh, and did quite well there. It is a weight off England’s minds – especially in an era when their long and medium-term planning has become so precise – to at last know against whom, when and where they will be playing their two warm-up fixtures. Cook insists, however, he and his team have simply let others worry about those details – and are thankful in any case to have the luxury of extended preparation time before what will be a hectic run of five ODIs, and then a Twenty20 for some, in under two weeks. “It is quite unheard-of as a one-day preparation period, to have 10 days,” he said.